Every year UCU seeks to negotiate an increase in pay with the Association of Colleges (AoC). At the end of every round of talks, the AoC advises colleges to consider the outcome of the national talks. We do not reach agreement at the national level; it is just a recommendation to your employer. And the problem is that colleges are no implementing AoC recommendations. UCU analysis revealed that less than one third of colleges implemented the AoC's pay recommendation from 2014/15. Almost 40% of colleges awarded no increase at all. This is a major reason why pay has been held down in FE and also why it is diverging across our colleges. You can compare your pay to the rates in other colleges using our online 'Rate for the job' tool. With so few colleges implementing anything that comes out of national talks, it's clear that we need to do something different. 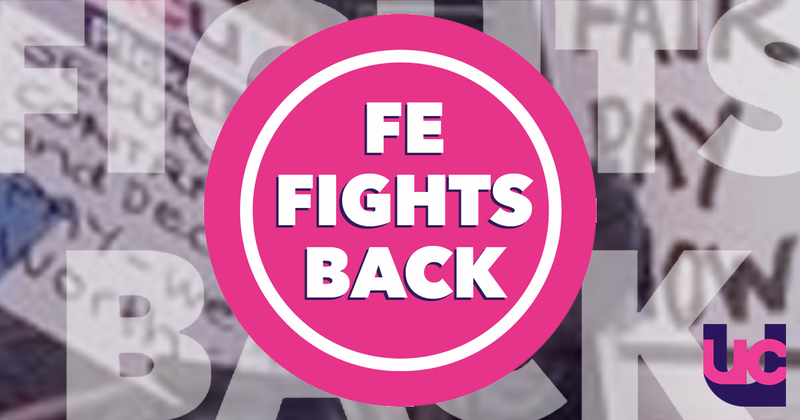 UCU's FE sector conference in 2014 supported the development of a new strategy to apply nationally overseen targeted pressure in order to rebuild meaningful collective bargaining. This approach is called 'National Plus'. If enough branches elect to be part of this strategy, we can rebuild collective bargaining. We can move from the defensive to the offensive by starting to put claims on colleges in a nationally co-ordinated way. If you would like further information on how to engage with this strategy then please contact your regional official or contact Andrew Harden, UCU's national head of further education. The claims submitted include locally agreed elements such as proposals to control working hours, close the gender pay gap, tackle local pay issues and addressing casualisation. The 'National Plus' initiative was put into operation in late 2014 and into 2015 and it is now delivering meaningful results for members. Congratulations to all the UCU branches involved in winning these collective improvements for their members. Sandwell College UCU has been trying for a while to convince the college's management to open up point 8 of the nationally negotiated pay scale, without success. The branch also had concerns about the distribution of women on the college pay scales. This year, the Sandwell UCU submitted a 'Part 2' pay claim and went into negotiations aimed at addressing these local issues. Management have now agreed to add point 8 to the lecturer scale and are engaged in ongoing joint work with UCU aimed at addressing the college's gender pay issues. Sussex Coast College Hastings UCU submitted a Part 2 claim this year to tackle problems with lecturers' pay and levels of casualisation. The branch have secured an agreement that has improved pay for the members. Under the agreement, the bottom point of the lecturer scale will be deleted to raise the entry salary for a lecturer. In addition the college have agreed to raise the ceiling on incremental progression by over £5500. The college has also agreed to offer fractional contracts to staff providing ongoing work at 0.2 FTE or above and to limit its use of variable hours contracts. Abingdon and Witney College UCU have won agreement on the payment of the 1% national award plus a local agreement on workloads. The new agreement regulates working hours and includes a weekly limit, annualised hours, and recognition of the Higher Education work done at the college. Cornwall College UCU put in a claim to address issues with their pay scale, seeking the removal of the bottom 2 points of the teaching scale and an upgrade for those staff. The college have now agreed to remove the bottom two points and staff on the lowest points have received a pay increase of £900 each. South Devon College UCU's claim sought a reduction in assessors' working hours to 1000 per annum and a raise in remission for NQTs to 72 hours. The college agreed to pay the 1% increase, backdated to August, while contact hours for NQTs will be reduced by an extra 36 hours. The branch agreed to pursue the elements of the claim relating to assessors next year. Nelson and Colne College UCU sought a revised lesson observation policy which removes graded observations in favour of a supportive and developmental approach and a work-life balance policy. The college agreed on the 1% pay increase, movement to ungraded lesson observations and on a new work-life balance policy. Runshaw College UCU sought agreement on a range of issues to workloads, including a consistent start and finish times across schools, timetabling to provide for sufficient breaks, compensatory time off for undertaking college trips/residential overnight stays, an agreement on teaching cover and workload allocation that reflects adequate time for marking. The college has agreed to pay the 1% national uplift and has also agreed a new work-life balance policy. Gateshead College UCU submitted a claim for a pay rise and action to address the gender pay gap. The college agreed on a 3.5% pay rise across the board. Discussions continue about the gender pay aspects. Burnley College UCU submitted a claim to ensure that lecturers are appointed to the right grade and for action to monitor workloads and for an improved probation policy. The branch won an agreement on these points. Canterbury College (2015) - UCU has reached a deal that provides a pay increase of 1% and will put nearly £1800 in the pockets of lecturers stuck on point 27 (the majority of academic staff at the college). It also removes point 21 and potentially point 25 next year to make the starting salary for both qualified and unqualified lecturers significantly larger. At City of Bath College - (2015) negotiations have resulted in an offer that provides for a 1% increase this year and for improvements in workloads, a key issue of concerns to members. The local branch has leave to put the offer to their members. City of Sunderland College UCU tabled a claim for action to tackle excessive workloads. The branch secured a 1% pay uplift and an agreement to convene a working party to look at staff workloads. Furness College UCU submitted a claim for more time for scholarly activity. The agreement secured a 1% pay uplift and a working party to look at scholarly time. Hull College UCU submitted a claim that sought to stop attacks on incremental progression, for action on workloads and for the development of a more developmental observation policy and procedure. A local agreement was secured that protected incremental progression and a more developmental observation policy. Lakes College - (2016) Lakes College UCU branch have successfully negotiated an agreement with management on pay and workloads. Management agreed to a 1% consolidated pay increase backdated to 1 August 1 2015 and to paying assessors the HPL rate when they are engaged in teaching. This led to a real rise in excess of 1% for assessors. The agreement also provides for a joint working group on workloads, with UCU and Unison representation which will allow members to bring workload concerns forward with management. Middlesbrough College UCU sought an agreement on workloads and grading and secured a 1% pay uplift for staff and a working group to look at workloads. Northbrook College - UCU Northbrook College branch successfully negotiated an agreement with their college management that provided for a consolidated increase across the board of 1%, the first that had been achieved in four years and increases in the maximum from point 31 to 32. The negotiations also introduced the prospect of increasing the scale to point 33 next year. Much progress was also made in setting up a workload allocation model which will be trialled. The negotiating meetings were very constructive and built upon the already amicable working relationship between the college and UCU. Oaklands College - Oaklands College branch negotiated an agreement at the end of last year that included a 1% increase in pay from 1 January 2015 (the anniversary date in this college), increased annual leave and improvements in terms of the employer's approach on workload and other issues. South Downs College - the claim meant that the branch not only resisted management attempts to cut holidays but they achieved a workload agreement and made progress on improving the position of casual staff. South Essex College (2015) - UCU reached agreement on a pay increase which consolidated last year's award; provides increases of between 1.5% and 1.0% for the bulk of our members; increasing the unqualified rate between 14.3% and 1.6%, plus an agreement on the majority of points in the workload code of practice. West Suffolk College - last year there was no pay award. This year (2015) a deal has been reached for a pay rise plus improvements on the employers' approach to workload.